The Trump administration plea was for a quick ruling on the president’s power to end special protections for so-called Dreamers, young immigrants who came to the U.S. illegally as children. Image courtesy of the LA Times. “The Supreme Court handed President Trump a significant defeat Monday, turning down the administration’s plea for a quick ruling that would have upheld the president’s power to end special protections for so-called Dreamers. 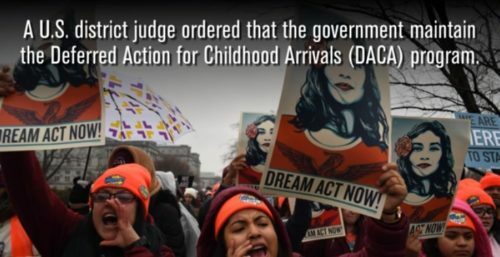 The court’s decision keeps in place a legal shield for nearly 700,000 young immigrants for the rest of this year, and perhaps longer, allowing people who have been covered by the Obama-era Deferred Action for Childhood Arrivals program to continue living and working legally in the U.S. Those whose existing DACA permits expire this year will also be allowed to apply for another two-year permit. Although the court’s action removes for now the threat of job loss and deportation, it also will extend the long-term uncertainty for the Dreamers — young immigrants who were brought to the U.S. illegally as children. Congress has been stymied on a legislative solution to their situation, and without an immediate deadline to force action, lawmakers almost certainly will not try again to forge a compromise on immigration before this fall’s midterm elections. To read the complete story by the Los Angeles Times, click here.